The presented cases are our original work. The Photoshop, the image retouching technique, was not utilized. Discoloration of the upper right incisor. All the teeth were bleached and a zirconia porcelain crown put on the upper right incisor. Due to gingival recession, the black margin of the crown on the upper left incisor was visible. The upper right incisor is discoloured. A new zirconia porcelain crown was done on the left incisor and a porcelain veneer on the right incisor to resolve the aesthetics of the smile. Bite disorder is present due to a disproportion in the size between the upper and the lower jaw. The smile aesthetics is disturbed. Full aesthetic and functional rehabilitation was achieved by incapsulating all the teeth with zirconia porcelain crowns. The lack of acceptable smile aesthetics is evident. 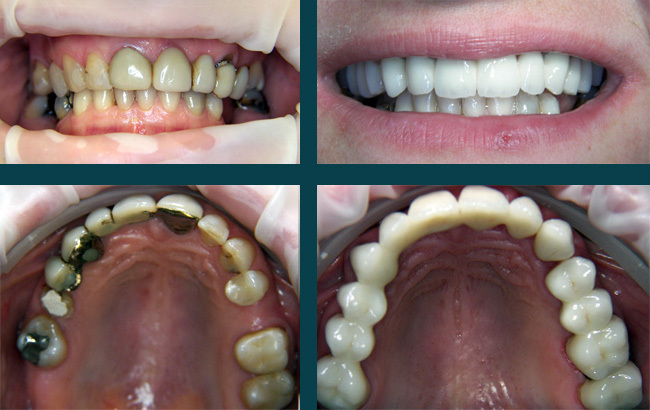 Functional and aesthetic rehabilitation was achieved by putting zirconia porcelain crowns on all the teeth in the upper and the lower jaws except the lower front teeth. The upper right incisor is discoloured. A zirconia porcelain crown was made to achieve satisfactory smile aesthetics. Old bridges and crowns in the upper jaw. To obtain a better smile, new metal porcelain crowns and bridges were made, avoiding the need to prepare the central incisors for crowns. The smile is no longer attractive due to numerous old discoloured fillings and old crowns. The fillings were changed, the gums treated and the teeth whitened. In the end, glass porcelain crowns were done on the upper front teeth. Teeth are missing, the bite is disturbed. After teeth bleaching, zirconia crowns and bridges were done in the front and right lateral part in the upper jaw, and the right lateral part in the lower jaw. Old and damaged crowns and bridges were replaced with new metal porcelain crowns and bridges in order to achieve full mouth rehabilitation. Old and damaged bridges and crowns were remade with new zirconia porcelain crowns and bridges and the smile is attractive again. Whitening of the teeth before and after. Teeth are missing in the upper and the lower jaw. 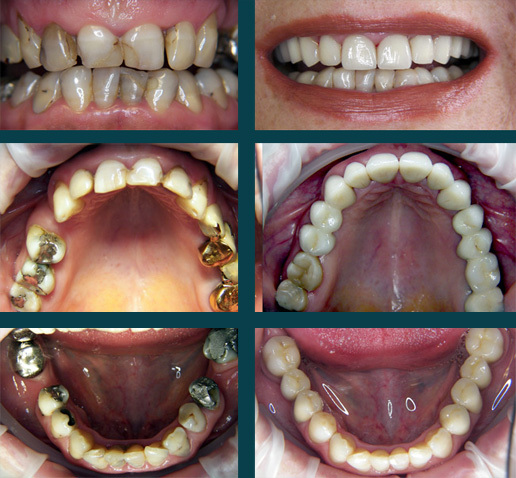 Oral rehabilitation was achieved by metal porcelain bridges and partial dentures with attachments. Gingival recession is evident on the upper right canine. After periodontal surgery, a gingival flap was taken from the palate and autotransplanted onto the denuded root surface. Gingival recession is evident on the surface of the lower right premolar. After parodontal surgery, the tooth root is no longer denuded. Gingival recession is evident on the second lower incisor. After periodontal surgery, the tooth root is successfully covered. The smile aesthetics is disturbed due to fractured upper central incisors and asymmetrical gingival margin. 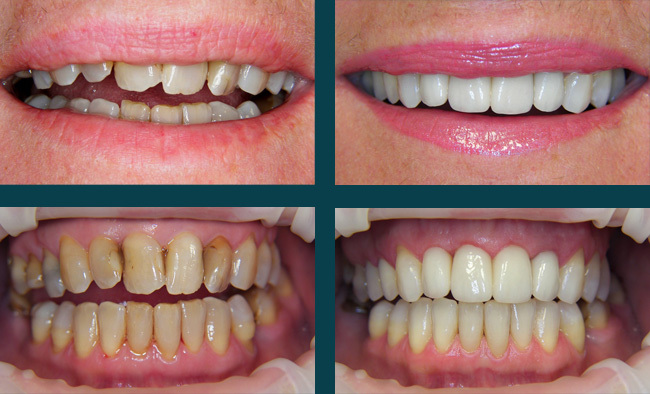 Gingival recounturing and teeth reconstruction with 'white fillings' resulted in a great improvement in the smile design. The upper central incisors are broken. 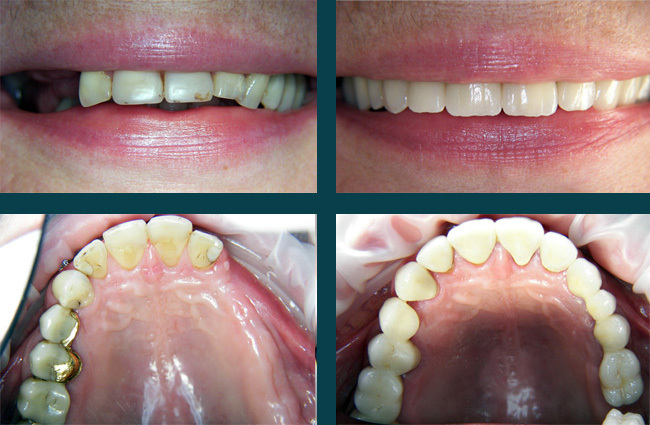 After tooth bleaching, the porcelain veneers were cemented on the central upper incisors. The upper central incisors are worn out. Porcelain veneers were made and smile redesign achieved. The upper central incisors are fractured. Avoiding any preparation for crowns, the teeth were reconstructed using composite, 'white filling material' and the smile was thus redesigned. The upper central incisors were fractured by a direct blow in the frontal teeth. The teeth were reconstructed by the means of the aesthetic composite restorations ('white fillings'). The lower left canine is discoloured and worn out. 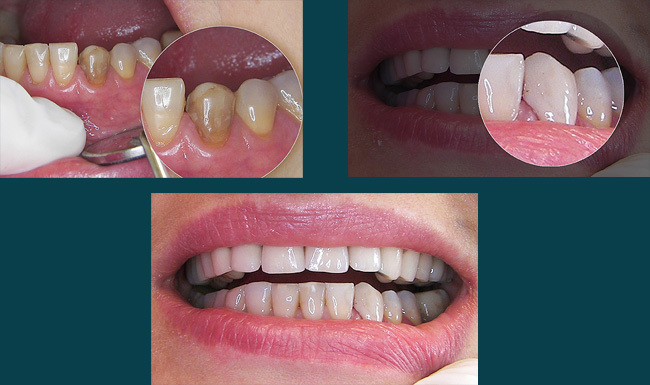 A composite veneer was done using the composite material for 'white fillings'. The tooth colour was thus corrected and its morphology reconstructed. Radiographic images of the right lower wisdom tooth before and after endodontic therapy. The only remaining are the lower frontal teeth. 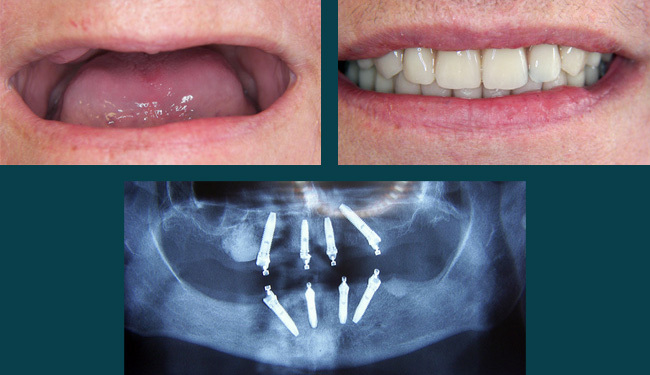 In the lower jaw, implants were implanted laterally, while in the upper jaw, four implants were implanted utilizing the All-on -4 implant technique. 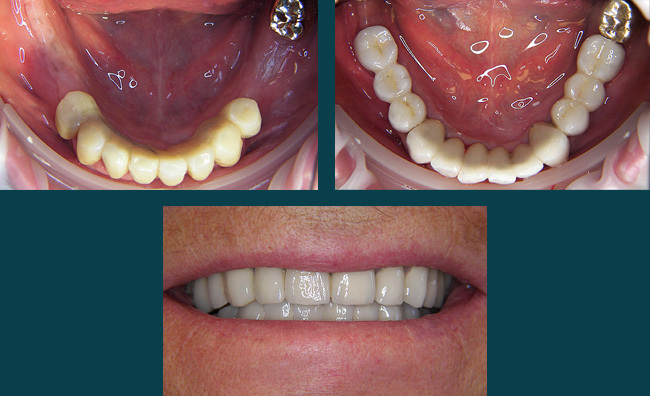 After osseointegration process , bridges over implants were made in the lower jaw and the circular bridge was done over the four implants in the upper jaw. The patient is toothless in both jaws. Applying the All-on-4 implant technique, circular acrylic bridges were made over the four implants in the upper and lower jaws and full mouth rehabilitation was achieved. The teeth are missing on the right side of the upper jaw. Due to the absence of the right molars, it was not possible to make a bridge but only a partial denture. 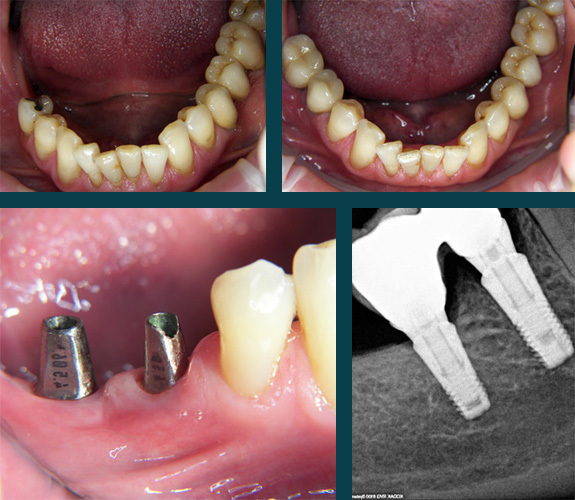 However, three implants were inserted after sinus floor elevation,and metal porcelain bridges were done over implants and the remaining teeth. The distribution and number of the remaining teeth did not allow a bridge to be fitted in the upper jaw, so a partial denture was indicated. 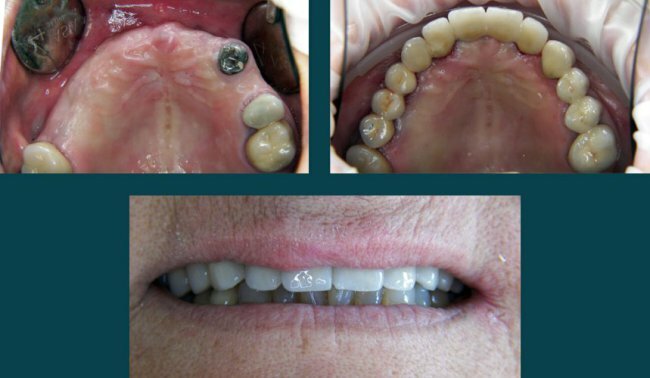 By implanting four implants, two with elevation of the sinus floor, it was possible to fix a bridge on the implants and the remaining teeth and thus avoid wearing a partial denture. The molar teeth on the right side of lower jaw are missing and the partial denture is indicated. Implanting 2 implants it was possible to make the metal porcelain crowns over implants and wearing a partial denture was thus avoided. The pictures present the abutments in implants and radiographic images of implants, abutments and crowns. Old bridges in the upper jaw have to be remade. The front teeth are missing in the lower jaw. The new metal porcelain bridges were done in the upper jaw. Two implants were implanted in the lower jaw, thus avoiding an irreversible preparation of the adjacent teeth for crowns, and finally a metal porcelain bridge was made over the implants. A) The upper lateral incisor is missing, an implant was implanted and the adjacent teeth saved. B) The upper lateral incisor is missing, an implant was implanted and the adjacent teeth saved. C) A zirconium porcelain crown over an implant. The molar teeth are missing in the lower jaw and a partial denture is indicated. By implanting four implants, two on the right and two on the left side of the lower jaw, metal porcelain bridges were made over the implants and the remaining teeth and a partial denture was thus avoided. The second left upper premolar is missing. To avoid preparation of the adjacent teeth for a bridge, an implant was implanted and resolved the lack of the missing tooth. The upper jaw is toothless and the alveolar bone reduced, which does not allow implantation of six to eight implants. The only solution is to make an upper denture. 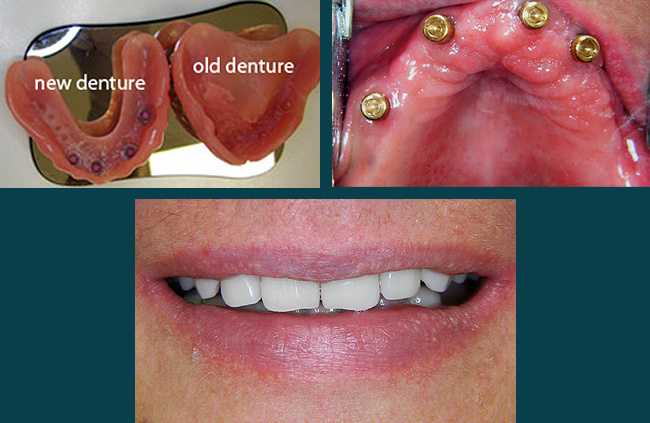 By implanting four implants, it was possible to make a reduced and fixed upper denture. The surgical procedure/gum lift/ was undertaken on the left and right upper canine and first premolar teeth. 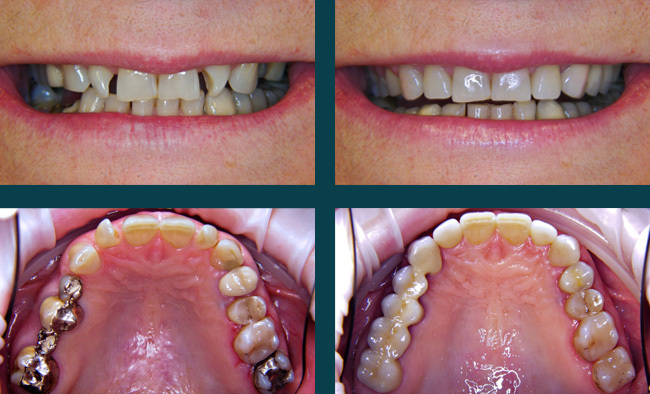 The above pictures present the right teeth, before and after situation,while lower pictures present left side before and after. 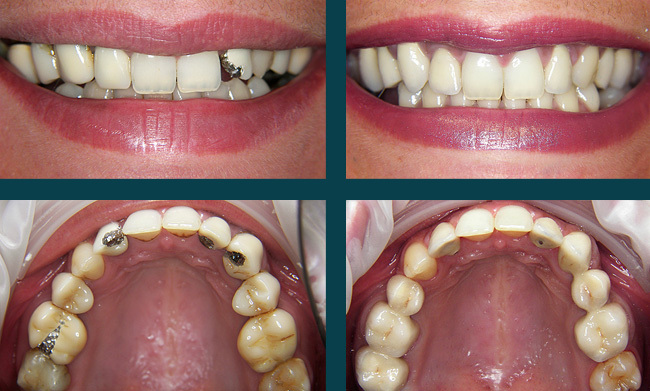 Aesthetic and functional rehabilitation was realised with glass porcelain crowns (IPS e.MAX IvoclarVivadent): Before & After. The upper second incisors are rotated, while the several teeth are missing in the upper jaw on the left side and in the lower jaw on the right side. 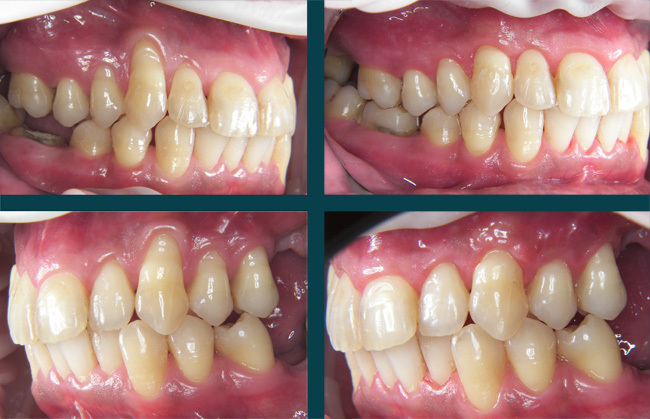 Aesthetic and functional rehabilitation was realised through the glass porcelain crowns (IPS e. MAX IvoclarVivadent) on upper left incisors and the metal porcelain bridges in upper right and lower left jaws. The central incisors remain untouched. Due to the progressive periodontal disease the remaining teeth were extracted, 6 implants implanted and metal porcelain bridge done. 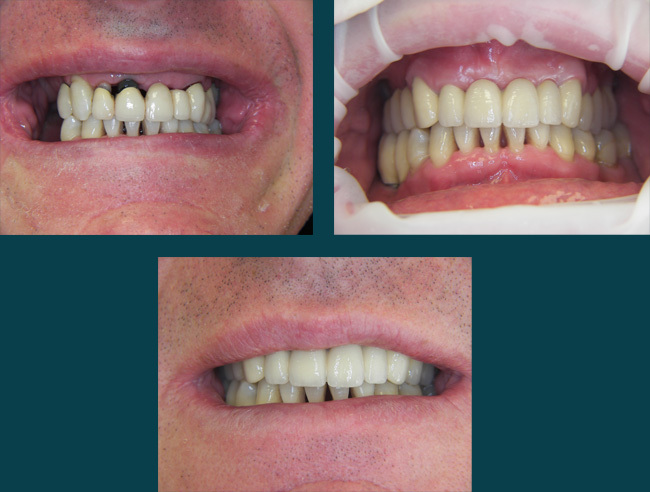 As if the bone loss was huge, it was necessary to rebuild "gingiva" over porcelain teeth utilising pink porcelain to avoid the too long teeth: Before & After. The frontal teeth are discoloured and have the old fillings. The smile make over was achieved due to teeth bleaching and glass porcelain crowns: Before & After. The smile was redesigned by making zircon porcelain crowns on the left upper incisors, and the porcelain veneers on the right upper incisors. 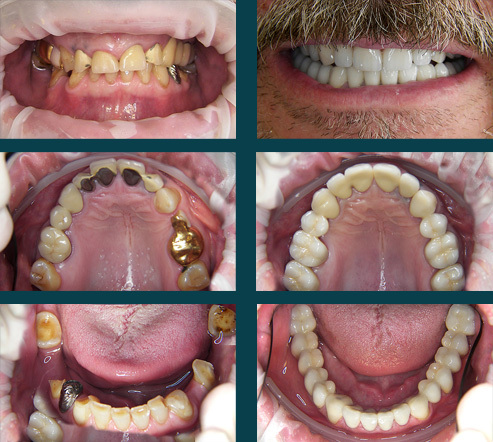 Aesthetic and functional rehabilitation was achieved with 4 implants and metal porcelain crowns over implants and teeth in upper jaw and over implants on right part of lower jaw: Before & After. 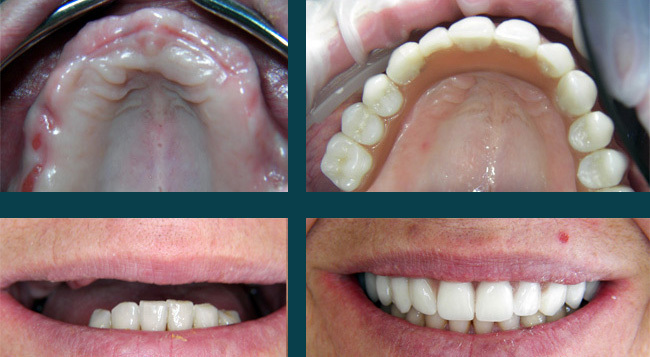 The composite veneer was constructed on the central left upper incisor: Before & After. 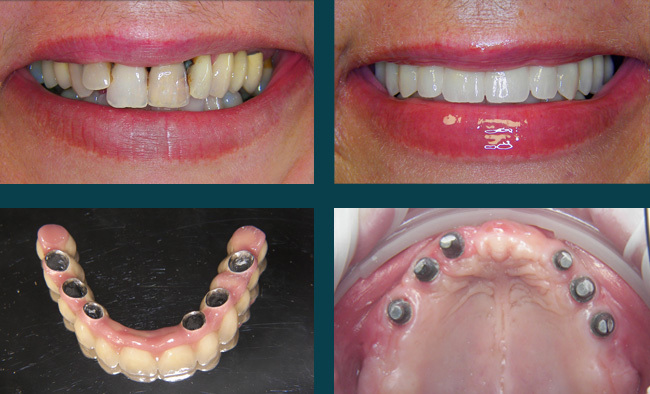 Aesthetic and functional rehabilitation was realised with metal porcelain crowns, partial dentures with attachments in the both jaws: Before & After.